Hello! About time I did an Outfit of the Day post haha, I think the last time I did one was early last year. My motivation to do this OOTD post was from you guys who suggested it in my giveaway's questjen of what you'd like to see more of on my blog. Anyway, this OOTD was really simple and that was essentially what I was aiming for. I attended a birthday dinner last Saturday and the venue was a very chilled, family restaurant hence I didn't feel that it was necessary to wear something dressy etc. If you saw my previous post on those magazine pictures, the current trends right now are fluros, pastels and metallics. I hope it wasn't a fashion crime for me to do a 3-in-1 lol! Before I decided to walk out of the door with this outfit, I admit that I did do a little research online (oh gosh this makes me sound so nerdy!). As I am not a self-proclaimed fashionista or anything close to it, I was a little unsure whether mint and orange/ochre would be an okay combination and to my surprise, I did find other people's OOTD with mint and orange! Great to have some reassurance - it surely gave me the green light to wear this pastel and bright combo out! And with the metallic accessories... I hope they were a suitable addition to my pastel and bright combo. Again I wasn't too sure but I didn't bother doing any researching aka stalking other people's OOTDs and getting ideas. XD But it should be safe considering that I normally always wear silver and gold jewellery. And eeee, I think your outfit looks good despite the bright colours! 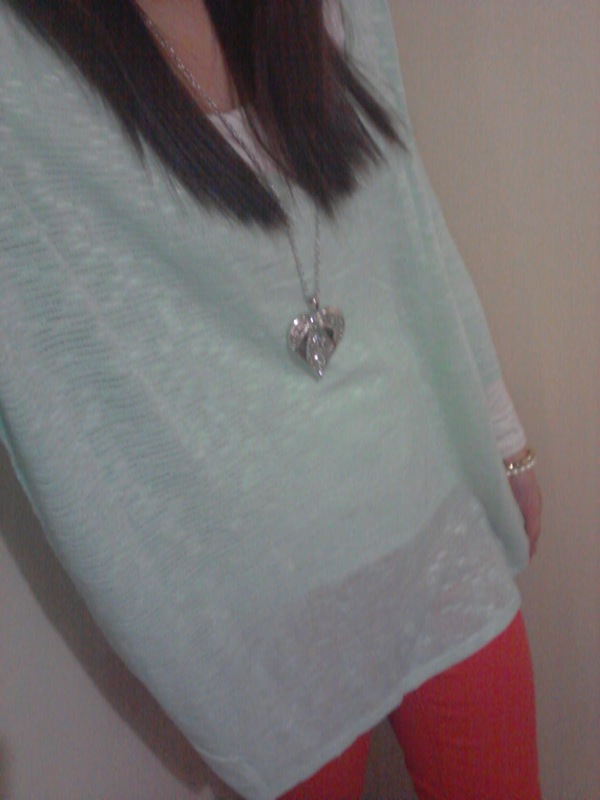 I find it hard to wear so much colours even though I like the combination :S And mmmm, at the momentttt ... I think I like pastel!! Cute outfit! 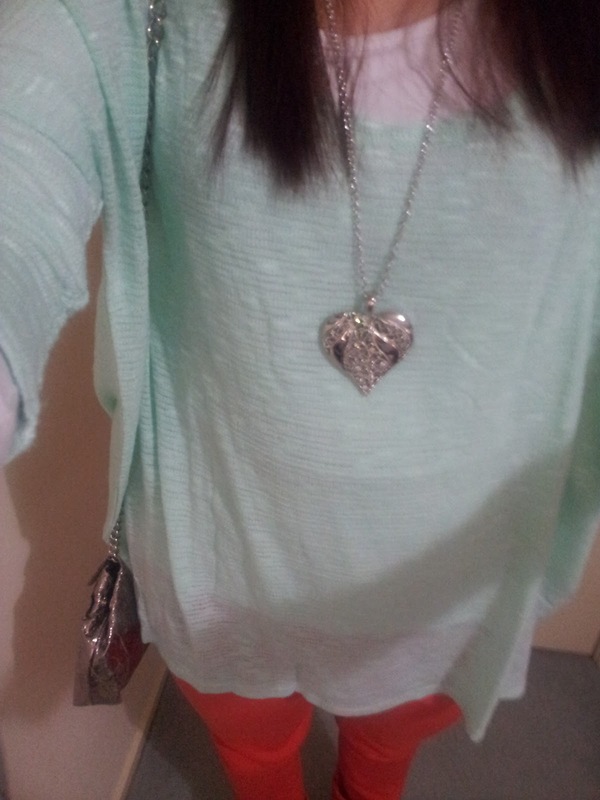 :3 I love mint and other pastel colours. So I definitely love the pastel trend. xD Plus the light colours are great for summer, it keeps you a lot cooler than black haha. :] I have a dslr, we should do photoshoots sometime! 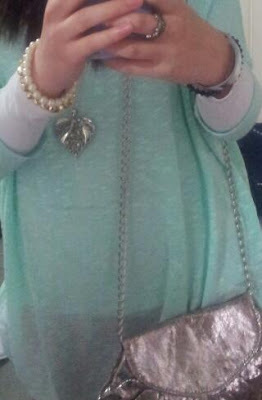 Your outfit is super cute : D I love pastels! Ooh I bought some red vero moda jeans on asos too, waiting for them to come in the mail!! lol. I have been researching fashion and outfits online too for recent outfits. We are all nerds :O) Love that top.